In December 2013, Vibha organized a year-end fund-raising campaign to raise $100,000, with the promise that the money will be used to expand some existing projects and to identify new projects and to reach new communities. The supporters of Vibha rallied behind the campaign and we reached the target! Grameen Siksha Kendra (GSK) in Rajasthan that has been doing innovative work in creating model schools (Uday Pathshalas) making community ownership as a key factor, has been encouraged to take its model to a number of Government Schools, through a program called “Vistaar”. Funding for Community Outreach Program (CORP, India), that has been doing exemplary work in the slums of Mumbai for the education of children, has been increased to expand their operations to another slum. After extensive screening, that involved pre-selection site-visits and several rounds of reviews, the team identified the following four projects – Eklavya and Samavesh (both in and around Bhopal, M.P) fit into Vibha’s framework of continuing to enhance the Public School System in India, while Saath (Gujarat) and Apna School (near IIT Kanpur, U.P) will further expand our intervention in the education of children of migrant construction workers. Eklavya is starting an education project for 895 children in 15 primary schools in 15 villages in the Shahpur Block located in Satpuras in Betul district of Madhya Pradesh. Eklavya will be implementing their dual methodology of community level intervention through Shiksha Protsahan Kendras (SPK) coupled with intervention at the Government school, involving the teachers and the state education department functionaries as direct stake-holders in the project. The effectiveness of the project would be measured based on three broad parameters which are accessibility, quality of education and improvement in learning levels of children in the age group of 6-10. Samavesh is similar to Eklavya, except that it is working in an urban setting in the city of Bhopal and will support 425 children in five municipal schools. Through active participation of the existing government school teachers, two hours every hour within the school are given to Samavesh to implement Activity Based Learning (ABL) program. Multi-Grade-Multi-Level(MGML) education kits, developed by Samavesh will be introduced in the schools and the teachers will trained so that the learning levels of the children can be significantly improved. Apna Skool, an education project for the children of migrant construction and brick kiln workers, is a project of Jagriti Bal Vikas Samiti, started by the faculty and students of IIT Kanpur. The goal of the project is to ensure that these children do not get absorbed as child labor. As the families migrate to their native villages during off-peak months, a process for continuing supplementary education to the children in their own villages in Jharkand, Bihar and Eastern UP will be initiated. Mid day meal/nutritional supplement, and primary healthcare to the children will also be provided. Apna Skool will study, learn and implement the model of Door Step School (DSS), one of Vibha’s successful models in Pune, and start involving the builders and the Government as stakeholders in the execution and scaling up the project. 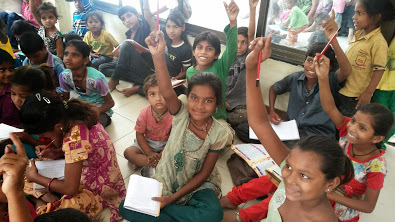 Saath, a very well established organization in Ahmedabad, will also work in implementing the DSS model and bring early education centers for the children of construction workers, thus minimizing the scope of these children entering the society as child laborers. Five large scale construction sites have been identified and these centers will be started to support approximately 250 children and providing them with 4 hours of informal education with nutrition support. Taking the DSS model as an example, Saath has already made the Builders as stakeholders in the success of this project and 50% of the nutritional costs and the space for these centers is provided by them.